Black Morrissey leather wallet with 17 card compartments, coin pocket and two notes compartments and press stud to hold wallet closed. Perfect to hold many cards and can have an initial or a name burnt into the leather to make a personalised gift for any occasion. When open the wallet measures 22 x 9cm. 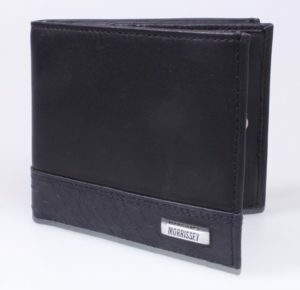 This wallet is Radio Frequency Identification Protected, protecting you from payment & Identity fraud from unwanted scanning of your credit cards. This will make the perfect wallet for any occasion. View other wallets from our range.